If you’re into all that kissing/hand holding/heart pounding stuff, here’s a book you might like. I’m not a big romance fan, but I AM into authors. I’m always curious to find out what makes them tick. So here’s a short interview with Amber. Q: Hi, Amber. Welcome to Inksplasher. Tell me a little about yourself. A: I’m a wife, a mother and a writer of Young Adult fiction. I traveled a lot as a child, but went to high school in Denver. Now I live in New Mexico with my husband and our three kids. Q: I visited New Mexico once. It was lovely. I want to get to know you better to, you know, see if we can be BFFs. Let’s try a personality test. Q: It will be painless. I promise. Okay, here are some rapid fire questions. Answer fast. No thinking about it first. Pizza or Pasta? Q: Off to a good start! Skittles or M&Ms? Q: Uhnnn. I’m sorry. We might not be able to be best friends, after all. Facebook or Twitter? A: Facebook. I don’t ‘get’ Twitter. Q: Me, too! I think I’m too much of a twit to tweet. Here’s another: Chocolate or Vanilla? Q: Okay! You just redeemed yourself after that Skittle debacle. One last question and this is the make or break one… Ready? Q: Harry Potter or Twilight? Q: You did it! So now that we’re virtual BFFs, can I ask a few questions about your writing? A: Fiction. I like to write about strong heroes and heroines. I love powerful, intelligent heroines, girls with a story to tell. A: My house has a loft and my computer is in there. I will give up my desktop when it gets pried from my cold, dead, hands. So I can’t move around when I write. Also my son is homeschooled and he doesn’t work if I’m not right next to him. So I sit there and do it. A: It really depends on the book. Sometimes I have just an inkling of an idea before I get to work, and some I have a general idea of plot and characters. I’m not much of a planner so I definitely don’t have it all worked out no matter what. Q: Do you write as you go or do you have the book all planned out from page 1? A: Definitely write as I go. Sometimes I know a little more than others, but really, I don’t plan. One time I wrote a book where the hero was about to go in a door, and as I was writing the scene I still had literally no idea what was on the other side of the door. Q: About how long does it take to write a book? A: On average, it takes me about four months. Sometimes it take longer, like “Rules of Engagement.” My non LDS urban fantasy novel took me TEN DAYS to write. That’s all. It was like a nightmare though. I couldn’t stop writing. I wouldn’t recommend that to anyone. A: Just relax. If it doesn’t work out right away, don’t freak. Just keep doing what your doing. You’ll get there eventually. Also, no amount of writing books by S. King or classes at conferences will give you the amount of benefits you’ll get just from reading and writing all the time. Just read and write. 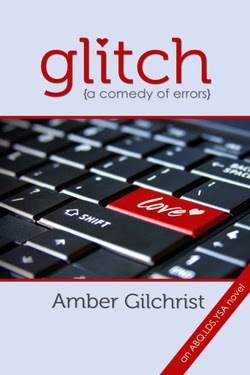 A: There’s Glitch, an ABQ.LDS.YSA novel, a romantic comedy. 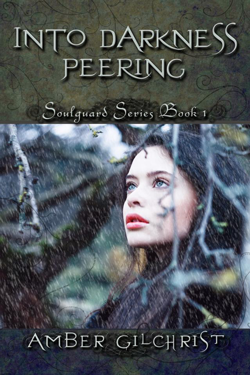 Into Darkness Peering is the first book in the Soulguard series. It’s a YA fantasy. 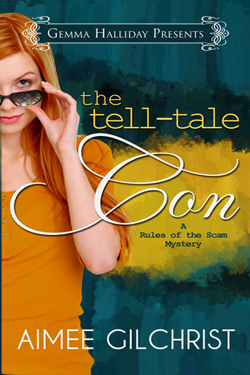 And then there’s The Tell-Tale Con, book 1 in the Rules of the Scam Mysteries, that I wrote under the pen name, Aimee Gilchrist. It’s a contemporary YA mystery. 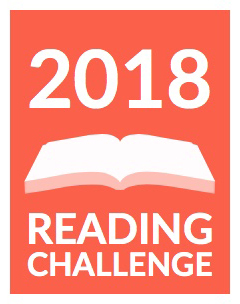 A: I have another mystery book due in March. I am also working on a partnership with an Avon Publishing author for a contemporary romance series and I’m planning a story for an LDS anthology. After that I will start writing the next book in the ABQ.LDS.YSA series. I’ll give a free book to anyone who can make a correct guess about who the next book will star! Thanks for the interview, Amber. It was a pleasure to have you here. Oh, and did I mention a Giveaway? No? Oops! 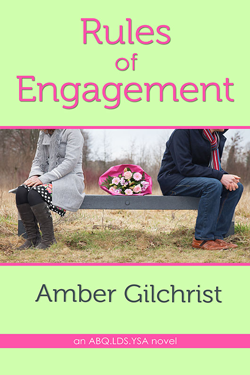 Amber Gilchrist writes YA for upper teens, as well as LDS Romantic Comedies. Amber loves mysteries and a good, happy romance. She also loves to laugh. Sometimes she likes all of them together. Thanks, Karlene! Loved the interview!